One thing we should understand in terms of the view of interdependence is that each and every phenomenon has its own source and reason for being. And so there is a reason why we have come to know one another so well and become such good friends. The reason for this is the presence of conducive conditions and the existence of outstanding aspirations; we can be quite sure about that. Because of our connection that springs from conducive conditions and fine aspirations, whenever any one of us goes through difficult times, the rest of us step forward and try to help out as much as we can. In recent years, all of you friends, wherever you may be found throughout the world, have provided incredible support to Lama Sang and indeed to all of our projects, and shown utmost concern for us in every possible way. Your kindness is indelible and always will be remembered. 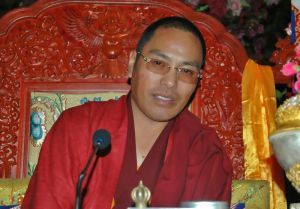 In keeping with the current situation, speaking as the representative of body, speech and mind of our precious guru Orgyen Kusum Lingpa, I wish to offer my sincere thanks, one hundred times over, for the kindness of all of Lama Rinpoche's students, wherever you may be found all over the world. At this time, we are left with no choice but to share with you news that your ears will find repugnant and will bring deep sadness to your hearts. All of us know perfectly well that in recent years the physical health of Lama Rinpoche has not been strong, and that in fact he has had a very serious illness. Beyond that, what you should also now know is that Lama Sang has continually told us that a very serious impediment to his life would occur during his seventy-sixth year, and that it would be very doubtful whether he could overcome this impediment. He is known to have said this repeatedly to hundreds and thousands of people. Moreover, when he was 23 years old, Lama Rinpoche wrote of a pure vision he had of the Blazing Fire Mountain charnel ground, wherein he said that in the earth cattle year he would return once more to that pure realm. And so in this way, through the coming together of these numerous and varied causes and conditions, the most unfortunate of all circumstances has suddenly come to pass. On February 26, 2009, on the second day of the new Tibetan earth ox year, precisely at 9:00 o'clock in the morning, as the final unfurling of the glistening flower of his Life Story, the Mind of Lama Rinpoche journeyed to the state of peace. Still, one thing in which we, his students, can truly rejoice with gladness and be inspired to greater faith regarding Lama Rinpoche's Life Story, is that despite having what is renowned to be a very serious illness, he actually suffered no pain stemming from it. Even while facing the dangers of approaching death and while remaining ill for an extended period of time, without any real prospect for recovery, his speech at all times remained warm and full of good humor. His physical body had none of the odor we would usually associate with someone so gravely ill, but rather gave off a scent like that of fine white sandalwood. In fact, all of his attendants can attest to the fact that he always smelled clean and fresh, like pure water or other fine fragrances. All of us could see quite clearly, too, through the gaze of his eyes and in other ways, signs and indications that he had reached a very high level of view and strength of meditative experience. My dear and true friends, these recent years have been a time in which we have struggled mightily, trying everything we possibly could, with great effort and sacrifice, to take care of the physical health of our Lama Rinpoche. We found and applied the finest medicines and treatments available anywhere in the world, and likewise made connections with the best doctors and hospitals too. From a spiritual perspective, this served as an accumulation of virtue that was by no means modest. Spiritual rituals and dharani recitations in uncountable numbers were performed and accomplished as well. Beyond that, vast numbers of disciples offered innumerable, fully pure prayers and aspirations from the bottoms of their hearts with the purest intentions. Even so, this situation came about which was simply too difficult to avert by any means; and so, I ask all of you to please be so kind as to understand that this is what has come to pass. One thing that is extremely important for all of you to do right now, without wavering in your minds and with stable faith and pure outlook, is to supplicate the Guru and receive the four empowerments over and over again. It would be unproductive simply to allow our minds to be overcome with suffering and sadness, or to lose sight of the truth of impermanence. We must be able to see the living example of our Lama Rinpoche passing into the state of peace as a profound, personal instruction that symbolically points us toward an understanding of the true condition of impermanence. You can also be sure that we will have the opportunity to discuss these matters more fully and in more detail in the near future. I ask all of you to please be so kind as to remain well in your bodies and relaxed in your minds.